The UN’s secretary general has said the Cold War is “back with a vengeance”. Antonio Guterres also warned about the dangers of escalation over Syria. 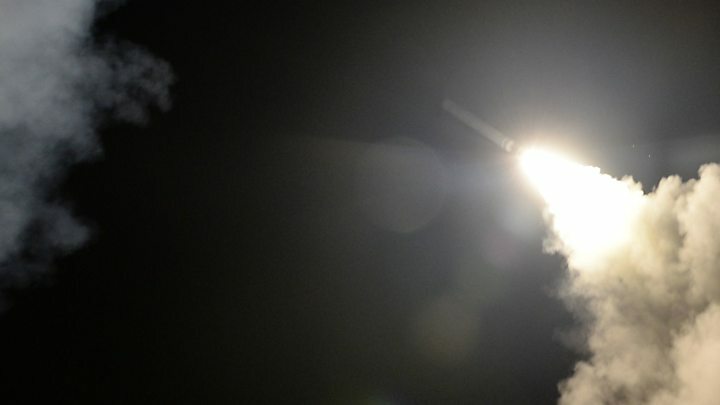 The US and its allies are considering launching missile strikes against Syria after a suspected chemical attack, an action which Russia – whose forces are there supporting the government- has said would risk starting a war. Russia has accused the UK of faking an attack, an allegation Britain dismissed as a “grotesque, blatant lie”. The Cold War, which followed the Allied victory in World War Two, saw the US and its allies facing off for decades with the Soviet Union, of which Russia is the main successor state. What exactly did Guterres say? Mr Guterres delivered his warnings at the opening of a bad-tempered UN Security Council meeting. He urged countries to “act responsibly in these dangerous circumstances”. What proof is there of a chemical attack? The US and France have both said they have proof the Syrian government attacked the Eastern Ghouta town of Douma last Saturday, but neither country has officially given further details. The suspected attack, in which dozens of people reportedly died, was denied by Syrian President Bashar al-Assad’s government. Rescue workers from the Syria Civil Defence and the Syrian American Medical Society, which supports hospitals in rebel-held areas, said victims were found with foam coming out of their mouths, blue skin and lips, and corneal burns. On Thursday, unnamed US officials told NBC News they had obtained blood and urine samples from victims which had tested positive for chlorine and a nerve agent. Control over the town has since passed from rebels to the Syrian and Russian military authorities. 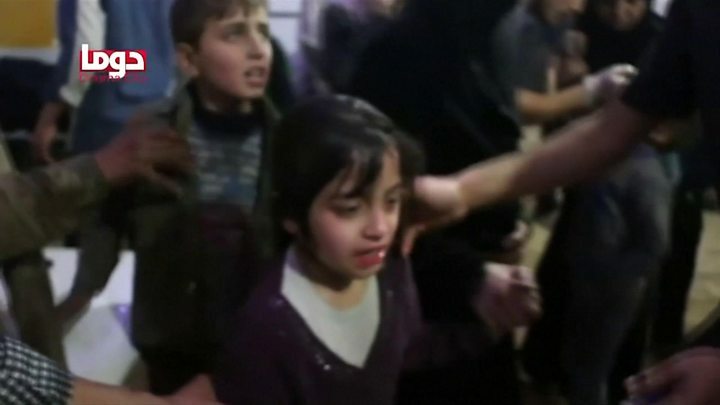 A UN report last year found the Syrian government responsible for a deadly chemical attack on the rebel-held town of Khan Sheikhoun, in which more than 80 people died. That attack was followed by a US cruise missile attack on a Syrian airbase. A delegation from the Organisation for the Prohibition of Chemical Weapons (OPCW) will arrive in the area of the suspected attack on Saturday. What are the Russians alleging? In a video produced by the Russian defence ministry two men speaking Arabic say they were working in the casualty ward of Douma’s central hospital when they assisted people brought in after the bombing of a multi-storey building. While they are clearly talking about the suspected chemical attack, both say the bombing occurred on Sunday 8 April when it actually occurred on Saturday 7 April. The two men say people were suffering from smoke inhalation, not chemical poisoning, but a panic began when one man said they were victims of a chemical attack. “This is grotesque, it is a blatant lie, it is some of the worst pieces of fake news we’ve yet seen from the Russia propaganda machine,” the UK’s UN ambassador, Karen Pierce said. What are Western leaders planning? In the UK, cabinet ministers agreed it was “highly likely” the Syrian government was responsible for the alleged attack and said the use of chemical weapons must not “go unchallenged”. The US president has said Russian President Vladimir Putin bears responsibility for the alleged attack in Douma because of his support for the Syrian government. On Wednesday he warned Russia that missiles were “coming” but later tweeted that he had “never said when”. 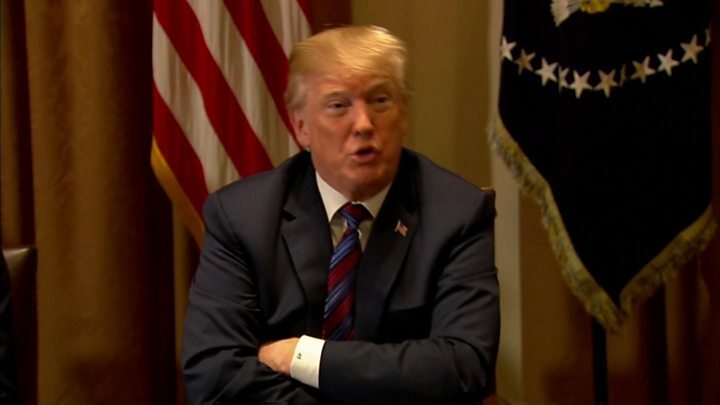 It “could be very soon or not so soon at all”, Donald Trump said. What is Russia saying about the risk of war? 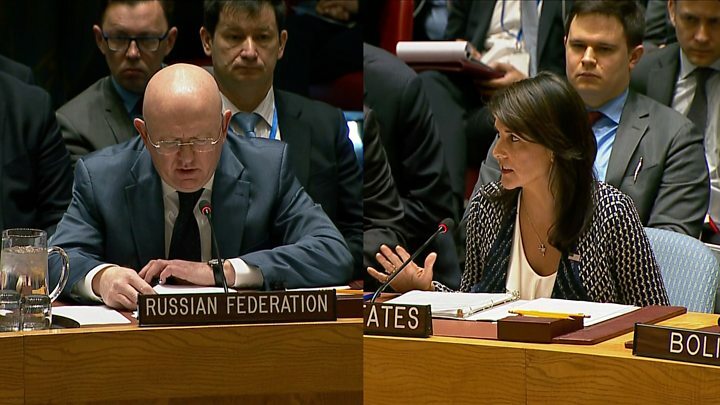 Before the Security Council meeting, Mr Nebenzia accused Washington of putting international peace at risk. “The immediate priority is to avert the danger of war,” he said on Thursday. Senior Russian figures, including the head of the military, have warned that US missiles will be shot down and their launch sites targeted if Russian personnel come under threat. After six weeks of heavy fighting and an estimated 1,700 civilian deaths in the Eastern Ghouta, rebels are now leaving the area. Thousands of remaining Islamist fighters and civilians left on Friday.